If you rent the DVD, you'll be able to watch this film in the original Japanese, which may be an entirely different experience -- as it has been with other Miyazaki films like "Princess Mononoke" and "Kiki's Delivery Service." 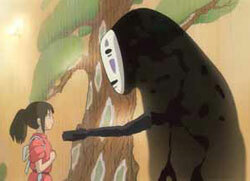 As for its transition to the small screen, "Spirited Away" may lose a lot of its magic when it's confined to a TV. Maybe I just don't "get" anime. I've been trying for years, and several movies from this often-mythological genre of Japanese animation have bowled me over: "The Ghost in the Shell," "Akira" and this year's "Metropolis," for starters. The enchanting, fantastic "Kiki's Delivery Service," by Hayao Miyazaki, the Steven Spielberg of anime, is a particular favorite of mine. But while all my fellow film critics seem to think Miyazaki's new film, "Spirited Away," is one of his very best, the fable-istic story of a little girl trapped in a parallel world of spirits left me unaffected and completely indifferent. The picture begins with 10-year-old Chihiro (given the voice of Daveigh Chase -- Lilo in Disney's "Lilo and Stitch" -- for the film's American release) reluctantly following her curious, irresponsibly clueless parents into a hidden, abandoned building while looking for a back road to the new house they're just about to move in to. Passing through the ruin and mistaking the world they find on the other side for an abandoned amusement park (I told you they're clueless), the girl's folks are inexplicably turned into pigs after pigging out on a freshly-cooked feast they find at an otherwise empty eating establishment in the completely vacant village. Running away in fear as the village comes to life with soot-colored apparitions, Chihiro is saved by a mysterious boy named Huku. He takes her to an enormous local bathhouse run by Yubaba, a tyrannical, saloon-madam-attired witch with a head hugely disproportionate to her midget-like body. "If you don't get a job," he says," Yubaba will turn you into an animal too." The rest of the elusively metaphorical story is something akin to a Japanese "Alice Through the Looking Glass," except that it seems to take itself far more seriously. As she tries to understand this strange place, Chihiro encounters an array of exotic beings -- the six-armed old man who runs the bathhouse boiler, a "Stink-God" that seems eager to please her while devouring everything else in his path, an elephantine "radish spirit," a giant baby, Yuban's more kindly twin sister, a trio of bouncing heads without bodies. From time to time she'll also put a little effort toward finding a way to rescue her parents (now lost in a huge pigpen with hundreds of other swine) and return home. An interestingly imaginative but never quite engaging experience with beautiful hand-animated production values, "Spirited Away" seems to meander rather aimlessly through Chihiro's vaguely confidence-building adventures before reaching a contrived conclusion in which Chihiro is given "one more test" by Yubaba that will determine her fate. One thing the American release of this film does better than any previous English-dubbed anime I've seen is to stay true to the distinctive, rather staccato speech patterns and voice intonations that are a hallmark of the genre. In recording sessions directed by Kirk Wise ("Atlantis," "Beauty and the Beast"), Chase and her fellow voice-talents (Suzanne Pleshette, Jason Marsden, Susan Egan, David Ogden Stiers, Lauren Holly and John Ratzenberger among them) have inhabited their characters so well that this film never suffers the kind of distracting awareness of an awkward translation that plagued the 1999 U.S. release of Miyazaki's "Princess Mononoke." But where "Mononoke" had a story with some meaning (it was a fairy tale allegory about mankind's exploitation of nature), "Spirited Away" seems to lack purpose. On the other hand, maybe it's not anime I don't get, after all. Maybe it's just this movie.